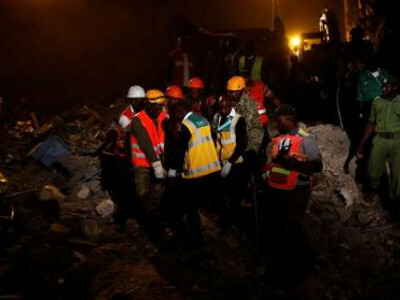 A second body was found in the wreckage of a collapsed residential building in Kenya’s capital, the Red Cross said. Emergency crews made the discovery on Tuesday night, the agency said on Twitter, around 24 hours after the seven-storey block fell down in Nairobi’s poor southern Pipeline Estate. Most residents fled after cracks appeared in the building on Monday. But one woman was found a day later and died from her injuries in hospital. The second body was found in the rubble. Forty-nine people died last year when another building collapsed during a heavy night downpour in a poor neighbourhood. Government ordered the demolition of many buildings after that incident, including the block that collapsed on Monday. The Red Cross said another missing person it had been searching for was found alive. Two children were pulled out alive on Tuesday evening.